In the world of social media, we have to expect frequent changes to the platforms we use. So it’s no surprise that Twitter started rolling out an all-new profile design this month. The look is similar to Facebook’s profile layout and makes profiles look more attractive with a layout that makes more sense and has less empty space. Here are some of the new changes to Twitter profiles. 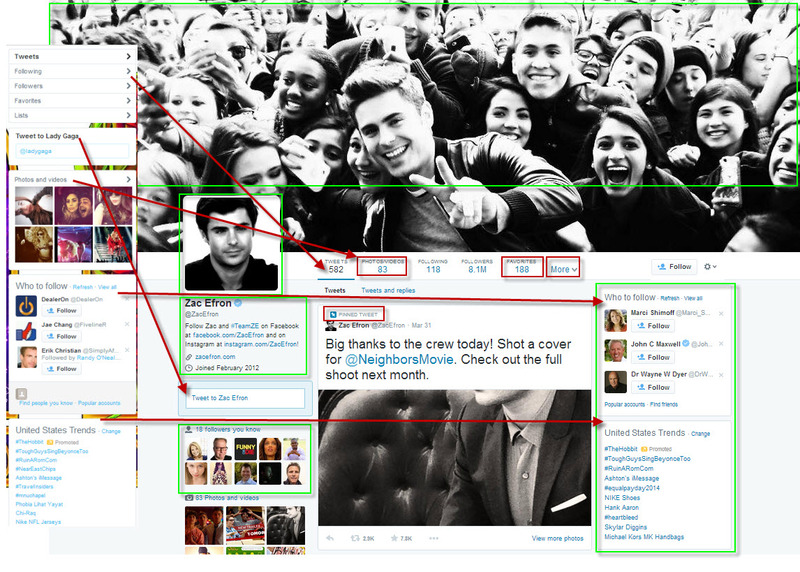 Content that was previously listed in 2 columns will be spread out to 3 columns and a much more attractive layout.Comparison screenshots of @ZacEfron & @LadyGaga from 4/8/14. Of COURSE it is! Critics have said this new layout resembles Facebook, but that’s not a bad thing. Since Facebook is the most popular social media site, Twitter can do itself a favor by adding that familiarity to its own layout. One of the top reasons I’ve heard for people not using Twitter is they don’t “know what to do with it.” By creating a more familiar layout and allowing users to have a more visual experience, Twitter can grow its user base by becoming more appealing. When Will My Profile Be Updated? Twitter started the roll out of the new design April 8, 2014 and has started with some celebrities, such as Zac Efron, Kerry Washington, Michelle Obama and Floyd Mayweather, and new accounts will have the new layout as well. The rest of us will start getting the new layout over the next several weeks, according to Twitter. Do you have the new layout? If so, share a link in the comments below so we can all check it out! Here’s a template for the new header and profile Twitter dimensions for the update starting April 8, 2014.